In contrast to most releases, which are focused on one or two major themes, the development during the release cycle of version 17.11 was almost entirely driven by the practical use of Genode as a day-to-day OS by the entire staff of Genode Labs. The basis of this endeavor is an evolving general-purpose system scenario - dubbed "sculpt" - that is planned as an official feature for the next release 18.02. The name "sculpt" hints at the approach to start with a minimalistic generic live system that can be interactively shaped into a desktop scenario by the user without any reboot. This is made possible by combining Genode's unique dynamic reconfiguration concept with the recently introduced package management, our custom GUI stack, and the many ready-to-use device-driver components that we developed over the past years. By stressing Genode in such a dynamic and interactive fashion, we identified and smoothened many rough edges and usability shortcomings, ranging from the use of client-provided pointer shapes, the proper handling of keyboard modifiers, mouse acceleration, over the configuration of the user-level networking facilities, to improvements of the file-system support. Since the sculpt scenario is based on Genode's custom package-management concept introduced in version 17.05, it motivated the packaging of all components required by this system scenario. Altogether, there are now over 150 ready-to-use depot archives available. At the platform level, the release unifies the boot concept across all supported x86 microkernels and offers the option to boot 64-bit kernels via UEFI. For both UEFI and legacy boot, Genode consistently uses GRUB2 now. Feature-wise, the most prominent topics are the native support of game-console emulators based on libretro, the ability to resize libSDL-based applications like avplay, and the further cultivation of Nim as implementation language for native Genode components. The VFS and C runtime received improvements in several respects. First, we reintegrated the resolver library back into the libc library as it is an essential feature for network applications. The former split was an ancient artifact we implemented when integrating the lxip network stack as an optional alternative to lwip. Speaking of ancient features, we also remove the rcmd code from libc. This feature for remote-shell access is not used in modern environments. The VFS server was adjusted to handle incomplete calls to stat() correctly. Genode's user-level network-routing component was originally introduced in version 16.08 and refined in version 16.11. In the current release, the NIC router has received two minor improvements regarding MAC addresses and ARP handling. In addition, it now has the ability to act as DHCP server or client for each configured domain. Let's first have a look at the minor changes. The MAC addresses that the NIC router allocates on behalf of its NIC clients are now of the proper type: "local" and "individual" and this way, conform to the ARP protocol. The NIC router now also considers ARP requests for foreign IP addresses coming from a domain. If there is no gateway configured for the domain, the NIC router itself jumps in as gateway and answers those requests with its IP address. Thus, if you have an individual gateway in a subnet behind the NIC router, make sure to have the gateway attribute in the according <domain> tag set. The attributes ip_first and ip_last define the available IPv4 address range whereas the lifetime of an IPv4 address assignment is defined by the ip_lease_time_sec attribute in seconds. The dns_server attribute is optional and declares the IPv4 address the NIC router shall state in the DNS-server option of DHCP. The DNS server may be located within a foreign subnet. When used as a DHCP server, the NIC router provides the following DHCP options to its clients: message type, server IP (set to the NIC routers IP), subnet mask, IP lease time, router IP (set to the NIC routers IP), DNS server (if configured), and broadcast address. If you want the NIC router to act as DHCP client at a domain, simply omit the interface attribute in the <domain> tag. In this case, the router tries to dynamically receive and maintain an IP configuration for the affected domain. Make sure that your DHCP server provides the following DHCP option fields to the NIC router: message type, server IP, subnet mask, IP lease time, and router IP. Also note that the NIC router drops all packets not related to its DHCP client functionality at a domain that (currently) has no IP configuration. As soon as the domain achieves to get a valid IP configuration, the router switches to the normal behavior. In traditional Genode system scenarios, the selection and configuration of the used device drivers are defined at system-integration time. This approach works fine whenever the hardware platform targeted by a given scenario and the use case of the scenario is well known in advance. But it does not scale up to general-purpose computing where one system image must be usable on diverse machines, and the concrete use cases are up to the end user. It contains the ACPI-discovery component and the platform driver. It hosts and automatically configures the USB driver such that USB storage and vendor-specific devices become available to user-specific driver components residing outside the drivers subsystem (e.g., a VirtualBox instance that drives an individual USB stick). The list of present USB devices and the current USB-driver configuration are provided as a usb_devices and usb_drv.config report respectively. Furthermore, the USB driver is configured to drive human input devices (HID) and provides the event stream as an input service. It spawns the AHCI driver and produces a list of present devices as a block_devices report. It hosts a PS/2 driver as well as an input-filter that incorporates the input-event streams originating from the PS/2 and USB HID drivers. The default configuration generates character events based on a configurable keyboard layout and key repeat, and includes scroll-wheel emulation and pointer acceleration for a PS/2 mouse (or, more importantly, the trackpoint of Lenovo laptops). It responds to changes of the capslock and numlock states, which are managed outside of the driver subsystem. Both states are consumed by the USB and PS/2 drivers to drive the keyboard-indicator LEDs. The numlock state is furthermore used to toggle key re-mappings performed by the input filter. The capslock state is incorporated into the modifier state as processed by the input-filter's character generator. The new subsystem comes in the form of a depot package, which depends on all required components. Internally, it employs a dynamic init instance as a tool to start and manage driver components on demand. The actual management component is a simple program of about 500 lines of code that merely consumes reports and produces configurations. It is so simple that it does not even perform any dynamic memory allocation. The new subsystem is present in the gems repository and illustrated by the gems/run/driver_manager.run script. It is also used as one cornerstone of the forthcoming general-purpose "sculpt" scenario mentioned in the introduction. Up to now, the acpica application was started up-front in most scenarios to get exclusive access to all PCI devices during initialization. Afterwards the platform driver took over the device access and announced the platform service. With the upcoming "sculpt" scenario, the desire arose to start the acpica application at a later stage, when the platform driver is already running. We adjusted the acpica and platform driver configuration slightly to cover this use case also. The ROM-filter component is able to transform XML data from multiple ROM modules into a new ROM module. It is prominently used to generate component configurations depending on global system state. The current release makes this tool more flexible by allowing verbatim copies of input content into the output XML node as well as the use of input content as attribute values. By adding a <rom name="..."> node into <modN> node of a chargen-filter, it is now possible to incorporate the content of the given ROM module into the modifier state. If the ROM module contains a top-level node with the attribute enabled set to "yes", the modifier is enabled. This is useful for handling a system-global capslock state. The new <button-scroll> filter turns relative motion events into wheel events while a special button (i.e., the middle mouse button) is pressed. The button and rate of generated wheel events can be configured per axis via the sub nodes <vertical> and <horizontal>. The button of each axis can be specified via the button attribute. By default, "BTN_MIDDLE" is used. The rate of generated wheel events can be defined by the speed_percent attribute. A value of "100" uses relative motion vectors directly as wheel motion vectors. In practice, this results in overly fast wheel motion. By lowering the value, the rate can be reduced to practical levels. By specifying a negative value, the direction of the generated wheel motion can be inverted. The consumed relative motion events are filtered out from the event stream such that pointer movements are inhibited while the wheel emulation is active. All other events are passed along unmodified. The new <accelerate> filter applies acceleration to relative motion values. The max attribute defines the maximum value added to the incoming motion values. The sensitivity_percent attribute scales incoming motion values before applying the (potentially non-linear) acceleration function. The curve attribute defines the degree of non-linearity of the acceleration. The value "0" corresponds to a linear function whereas the maximum value "255" applies a curved function. The default value is "127". Both the PS/2 and the USB drivers have gained the new <config> attributes capslock_led="no", numlock_led="no", and scrlock_led="no" (with their default values shown). The attributes can have the values "no" (LED is turned off), "yes" (LED is turned on), or "rom". In the latter case, the driver reads the LED state from a dedicated ROM module called "capslock", "numlock", or "scrlock" respectively. The ROM module is expected to have a top-level XML node with the attribute enabled set to "yes" or "no". The drivers reflect this state information by driving the corresponding keyboard-mode indicator LEDs. Driven by use cases like the "sculpt" scenario mentioned in the introduction, the Nitpicker GUI server and its helper components received an overhaul. Besides modernizing the implementation according to our today's best practices, we succeeded in removing the focus handling as the last remaining builtin policy from the GUI server to an external component, thereby making the GUI server much more flexible. This line of work is complemented with an improved way of supporting client-provided pointer shapes, and a new general component for handling global keys. Nitpicker's existing "hover" report features the information of the currently hovered client (e.g., the client's label and domain). In the new version, the report also features the information whether or not the user has actively moved the pointer during the last half second. This is analogous to how the "focus" report features user-activity information about recent key press/release activity. When combined, the "hover" and "focus" reports provide a way to detect the absence of user activity, e.g., to implement a lock screen or screen saver. If both reports have no active attribute, such a component can schedule a timer. Whenever either of both reports shows an active attribute, the timer is reset. The lock screen becomes active once the timeout triggers. For debugging purposes or for implementing global key combinations, Nitpicker now offers "keystate" reports. The report is updated each time, the user presses or releases a key. It lists all currently pressed keys along with the key count as observed by Nitpicker. The new clicked report features the information about the client, on which the user actively clicked most recently. It is useful to implement a click-to-focus policy outside of Nitpicker. Traditionally, Nitpicker had a builtin policy about the input focus, which ensured that only the user can change the focus. The input focus is changed whenever the user clicks on an unfocused view. If permitted by the policy of the domain, the clicked-on client receives the focus. The policy configuration allows one to define domains that never receive any focus, domains that receive the focus only temporarily while the button is kept pressed (the so-called "transient focus"), or domains that can receive the regular input focus. However, there are situations where this builtin policy stands in the way. For example, in a scenario based on virtual consoles, the user wants to be able to switch virtual consoles via keyboard shortcuts and expects the input focus to match the currently visible console regardless of any mouse clicks. Another example is the change of the input focus via key combinations like alt-tab. As an alternative to the builtin policy, the new version of Nitpicker is able to respond to an externally provided "focus" state in the form of a ROM session. This state is driven by a dedicated component, like the new nit_focus component that implements the traditional click-to-focus policy. By supplying the focus as a ROM session to Nitpicker, it becomes easy to globally overwrite the focus if needed. One particular example is a lock screen that should capture the focus when becoming active, and yield the focus to the original owner when becoming inactive. The new explicit focus handling can be activated by setting the <config> attribute focus to the value "rom". Further down the road, we plan to make this option the default, with the ultimate goal to remove the original builtin policy. A <bool> node declares a boolean state variable with the given name and its initial value (default is "no"). There may be any number of such variables. The <press> and <release> nodes define how key events affect the state variables. Each of those nodes refers to a specific state variable via the bool attribute, and the operation as the change attribute. Possible change attribute values are "on", "off", and "toggle". Otherwise, the report's enabled attribute has the value "no". Possible conditions are <bool> and <hovered>. The <bool> condition is true if the named boolean state variable has the value true. The <hovered> condition is true if the currently hovered Nitpicker client belongs to the domain as specified in the domain attribute. The latter information is obtained from a ROM module named "hover", which corresponds to Nitpicker's hover reports. The nit_fb component translates the Nitpicker session interface into the low-level input and framebuffer session interfaces such that raw framebuffer clients can be hosted as Nitpicker applications. The position and size of such an application is configurable. The new origin attribute denotes the coordinate origin of the values specified in the xpos and ypos attributes. Supported origins are "top_left", "top_right", "bottom_left", and "bottom_right". This attribute allows one to align a Nitpicker view at any of the four screen corners. The width and height attribute values can now be negative. If so, they are relative to the physical screen size. E.g., when using a screen size of 640x480, the effective width for a width attribute value of "-100" would be 640 - 100 = 540. The pointer component that accompanies Nitpicker by default shows a static pointer shape only. In advanced scenarios, for example when multiple instances of VirtualBox are present on one screen, it is desired to show the shape provided by the currently hovered guest OS. This was accomplished by a special vbox_pointer component with access to both the client-provided shape and Nitpicker's hover report. Whereas this component sufficed for relatively static scenarios, the pointer's policy configuration became rather difficult in dynamic scenarios where the labels of the displayed VMs or applications are unknown at system-integration time. The new version simplifies the shape handling by letting the pointer component play the role of a "Report" service that consumes "shape" reports. This way, the pointer implicitly knowns the label of the shape-providing client. It matches the labels of its report clients against the currently hovered client as obtained from Nitpicker's hover report. If there is a match, the pointer displays the matching client-provided shape. Since the new component is generically applicable, e.g., not only for VirtualBox-provided shapes but also for Qt5-provided shapes (Section Displaying of Qt5's custom pointer shapes), it has become Nitpicker's default pointer component. In this release, support for Microsoft's proprietary RNDIS protocol was enabled in our Linux-based USB network driver. Thereby it is possible to use the network sharing ("tethering") features provided by many Android devices. The driver was tested using devices from different vendors. Since the RNDIS driver is based on the cdc_ether driver (the open protocol alternative phone vendors should be using), it had to be enabled as well. Due to lack of any devices supporting CDC, while enabled, the driver could not be tested and must be considered experimental for now. The porting and enabling of the driver was done by Alexander Senier from Componolit. Thanks for this welcome contribution! We extended the rump_fs file-system server with the ability to mount and unmount the underlying file system on demand. The server will mount the file system on the first established session request and in return will unmount the file system when the last session is closed. In case all clients are shut down before the server is stopped, this prevents leaving the file system marked as dirty. Even if the file system itself is in a clean state, the dirty bit might otherwise trigger a false negative result when performing a file-system check. In release 14.02, we added a e2fsprogs Noux port. Since the use of the VFS library within libc, Noux is not strictly needed anymore for running tools like the e2fsprogs utilities. On the contrary, it increases the complexity of a file-system management mechanism needlessly. With this release, we introduce a port of the e2fsck tool from e2fsprogs to Genode that does not depend on Noux. It can be used by a management component to check an ext2 file-system prior to starting rump_fs and in case of errors to attempt to fix them automatically. Additionally, we significantly stripped down Genode's version of the Rump kernel. By integrating Rump directly into Genode's build system, compiling and checking out required Rump sources only, we were able to reduce the compile time of rump_fs and the source archive size (from about 700 MiB to about 10 MiB). Support for the Nim programming language was introduced in the 17.05 release and during this release period, our understanding of Nim, its idiom, and its interaction with the Genode framework progressed to a point where native components can be reasonably implemented using the language. The hotkey_edit component in the world repository toggles XML sections in and out of a file managed by xml_editor when triggered by key input events. The component is written in Nim, acts as a "Nitpicker", "Input", "Report", and "ROM" client, and follows the Genode paradigm of a state-machine driven by asynchronous signalling. The application specific source is also less than one hundred lines of code. To enable client usage of Genode services the respective Client or Connection C++ classes are wrapped as Nim objects by taking advantage of the Genode Constructible class to be able to manually invoke constructors during object initialization. Wrapping service classes and their methods is currently done by hand, but changes to service interfaces are so gradual that it is more effective than automated code generation. Signal handling is achieved using anonymous procedures and happens when the thread of execution winds back to the initial entrypoint. This approach is just the same as for components that are linked to the libc library, and contrasted with components linked to the posix library. The Nim language has no conventions for a special "main" procedure like C or Go, so signals handlers are dispatched by default after all top-level statements have been executed. The language has experimentally proven to be flexible enough to implement RPC servers, but more experience is required to determine if a garbage-collected language can manage to abide by transient RAM resource quotas, as any multi-session server must do to reliably serve an indefinite number of clients. The standard language runtime also depends on the libc library, which is relatively expensive and complicated for typical native components. This dependency also prevents the implementation of VFS plugins in Nim, which must be available as the C runtime is initialized. Removing the dependency is certainly possible, but it remains an open question of whether it is practical to maintain such radical changes. To experiment with the Nim language, a recent release or development version of the compiler is required. To this end, the Genode toolchain uses a custom compiler by default. A script is provided to build the recommended version at tool/tool_chain_nim. We adapted the gdb_monitor component to the asynchronous session-creation procedure introduced in Genode release 16.11. The current release makes it possible to debug components that implement Genode services. Qt applications often make use of custom mouse-pointer shapes, for example when a text input field is hovered. We enabled this feature for our Qt5 port by letting Qt report its custom pointer shapes to the newly enhanced pointer component described in Section Simplified handling of client-provided pointer shapes. The use of the new feature is illustrated in the qt5_calculatorform.run script. Note the rewriting of the shape session label. Genode supports user input with keyboard and mouse attached via PS/2 and USB as well as USB touch panels. 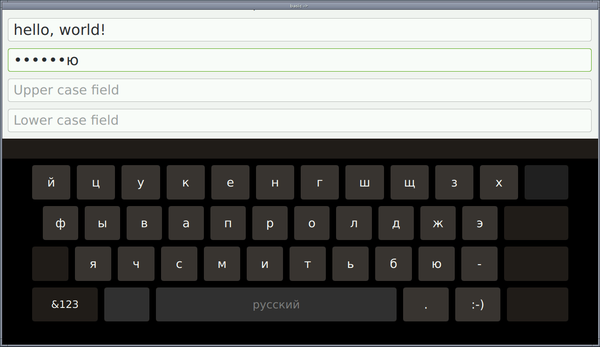 The current release brings an option for Qt5 applications to support textual-information input in situations where a hardware keyboard is missing. The Qt5 input stack was extended for platform input contexts and the accompanied example run/qt5_virtualkeyboard.run showcases the feature. Thanks to Johannes Kliemann for his contribution! There are quite a few ports of SDL-based software available on Genode that work well when executed in isolation, e.g., a game running in full screen directly in the frame buffer. However, when running in a common desktop scenario, the fixed size of the frame buffer used in Genode's SDL video back end is a noticeable limitation. So, in addition to removing the usage of deprecated APIs in the SDL back ends, we lifted this limitation as well. Removing the usage of the deprecated APIs, which rely on a global environment, led to the addition of the Genode-specific initialization function sdl_init_genode that has to be called prior to SDL_Init. For that purpose, we introduce a stub library sdlmain. In accordance to the posix library, it handles command-line argument parsing, proper SDL initializing, and the call to SDL's main function. For interacting with the Genode API, we might have to execute signal handlers, e.g., whenever a framebuffer mode change signal is received. This is complicated from within a thread that is running libc code, which is true for most if not all SDL-based components. Therefor and because those components come with their own event loop, that polls SDL for events, we start the main function in its own thread. The main entrypoint of the component does all the signal handling and the dispatcher flag signals in a way that SDL can transform them into SDL_Events and inject them into the event loop. This changes enable the seamless resizing of a running avplay instance. A component that has been in the world repository for almost a year has been refactored and is ready for mention. The retro_frontend is a native front end to games implemented as "Libretro cores". Libretro is an API that exposes generic audio/video/input callbacks from a dynamic library to a front end. The front end handles video output, audio output, input, and the application's life cycle. This novel arrangement is intended to minimize the effort of porting games to different platforms and to increase future backwards compatibility. On Genode, these cores are executed frame-by-frame as compelled by the front end rather than by a main loop within the game. Game assets are loaded as configured in a general manner at the front end and multiple input devices can be managed and mapped into cores. This in effect moves the platform abstraction layer tighter around the game engine and relinquished more control and configuration to a native layer provided by the user. Documentation on using the front end can be found in the world repository along with examples for emulating a few game consoles. With the previous release, we already added support for GRUB2 when booting in UEFI mode. However, for non-UEFI boots, we still relied on GRUB-0.97 and ISOLINUX from the Syslinux Project as boot loaders. With the experiences gained from GRUB2, we decided to modernize our bootloader chain for x86. With this release, we solely use GRUB2 during all x86 boots. For ISO creation, we now leverage the images - shipped by GRUB2 - embedded.img and eltorito.img, together with the xorriso tool. Due to this change, we were able to remove the ISOLINUX binaries and eltorito files of ancient GRUB1. The grub2 port contains the GRUB2 binaries. Additionally, the port contains the instructions and the references to the git source code of GRUB2 used to generate the bootloader binaries. With the information provided within the port, one can easily reproduce the GRUB2 builds if desired. With this release, we enabled support to leverage non-executable memory on Genode. On hardware and kernels supporting this feature, it is now enabled by default. On ARM this feature is available to all supported kernels, namely our own hw kernel, seL4, and Fiasco.OC. On x86 the 64bit kernels hw, NOVA, and Fiasco.OC support this feature. SeL4 currently misses support on x86. The remaining x86 32bit kernels (i.e., OKL4, Pistachio and Fiasco) don't offer non-executable memory support, since they do not configure the page-tables in the PAE (physical address extension) format, which is required by non-executable memory. In the previous releases, we extended our seL4 support and thereby collected a patch series for the seL4 kernel, e.g. UEFI boot support. We submitted the patches to the seL4 developers who integrated most of our changes into the seL4 7.0 kernel release. Additionally to the update, we extended the UEFI framebuffer support for the seL4 kernel so that our simple boot framebuffer driver may now utilize the graphics device if setup by GRUB2 during UEFI boot. The patches to the kernel got submitted to the seL4 maintainers for review and for inclusion. During the previous releases, several preparation steps were made to enable the execution of Genode's core as privileged code inside the protection domain of each component. With this release, we pushed the genesis of the base-hw core component and its kernel library to finally achieve that goal. Now, the virtual address space of each component is split into a privileged and an unprivileged part. The privileged part is shared between all components and does not vary when switching between different protection domains. Nonetheless, it is accessible by the privileged threads of core and the kernel library's context only. The advantages of this approach are less context switch overhead and less complex assembler code with respect to the platform-specific exception and system call entry path. Genode's configuration is based on XML and gets validated by xmllint during each run tool invocation. Up to now, we used xmllint to check for a valid XML syntax. and gets applied by xmllint.